Home india What is the rare and exquisite phenomenon of fire rainbow which took place in Mumbai? 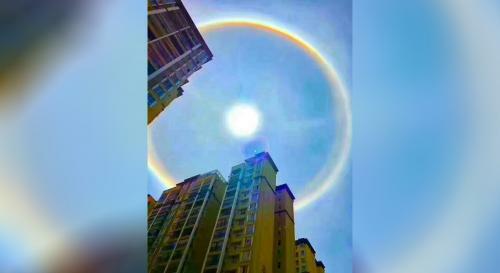 What is the rare and exquisite phenomenon of fire rainbow which took place in Mumbai? The internet is storming with images of a fire rainbow being spotted in Mumbai and a pilot beautifully capturing it. So, what is a fire rainbow? Circumstantial arc is an optical phenomenon which is formed by the refraction of sun- or moonlight when ice crystals in the shape or form of a plate are suspended in the atmosphere. The story claims that “fire rainbows, a rare phenomenon seen after take off from Mumbai airport. Fire rainbows occur when light passes through cirrus clouds.” What is the truth about this situation? Well, the picture is not from Mumbai and neither is it called fire rainbows. The picture is taken from Idaho/ Washington border in the year 2006 and lasted for approximately for an hour. The spam message was cleared by snopes.com and the image is meant to target Mumbaikars and Indian people. However, you may feel free to give credits to the original place where the phenomenon took place.